Almost all Jedi, barring non-humanoid anatomy difference, wear a visible undertunic. The few Jedi that have no visible undertunic (therefore we may assume they have none) have a very unique outfit usually based on alien anatomy. The only human example I have ever seen is Adi Gallia. Most undertunics are v-necked and possibly overlapping sides as the overtunic is. They can come all the way up to the neck (usually Men) or lower (feminine touch for women). Some variations seen are turtlenecks, square neck, or even a reverse V, all of which will be noted and sourced in the table below. They are earthen in color and are usually made of a knit fabric or a lightweight fabric. Many times the sleeves are made a bit long, so the excess is scrunched up at the wrist. Key: First Class sources are Jedi Outfits that have been immortalized in fabric and are seen in the Prequel Trilogy on screen and in Behind The Scenes footage. Second Class sources are still official in that they are in licensed artwork, comics, or video games etc., but are Expanded Universe and sometimes are not considered Canon by certain costuming groups. The Clone Wars costumes are included in this category as it is animated, and George Lucas may not have put his seal of approval on every animated costume as he did with the movie costumes. Source: First Class This is an example of the most common design of undertunic, one which is crossed over like the outer tunic. Since the undertunic is never seen, it can be made to overlap like the outer tunic, or the neckline can look crossed over, but really be a pull over. It is usually made in a comfortable, lighter weight fabric such as a knit jersey (silk or cotton) or a light cotton or linen. The color is most often a different shade of brown than the outer tunic, but doesn't have to be. Stass Allie wears a common v-neck, overlap undertunic and below are other examples of this same neckline. 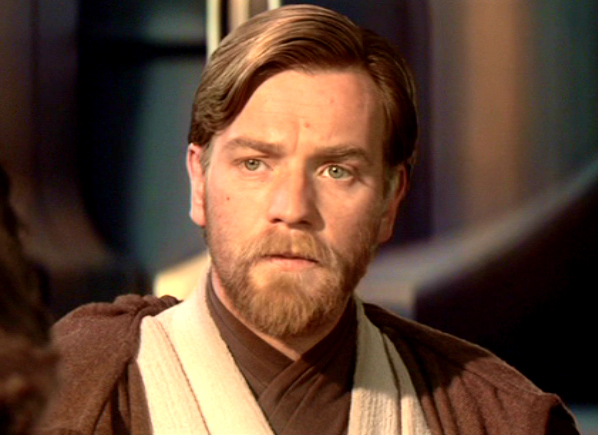 Source: First Class Here, Obi-Wan Kenobi wears the common crossed-over undertunic with the v-neckline in Revenge of the Sith, however his is different as it appears to be pleated. Source: First Class Depa Billaba's neckline is considered square because it is horizontal across the front of the chest. The fabric on hers has lines on it that come at an angle and is possibly a textured fabric. 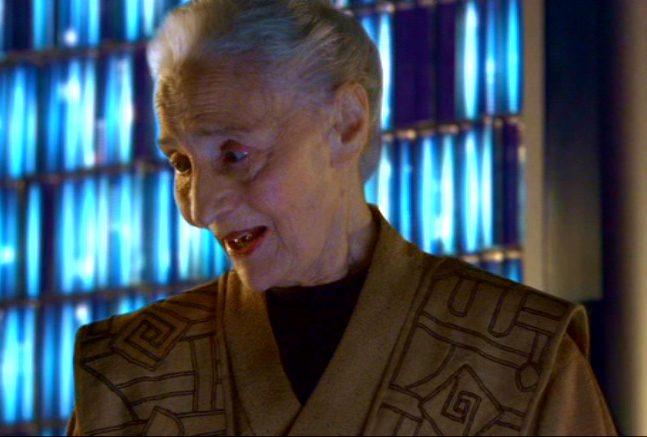 Source: First Class Crewnecks (not unlike the neckline on a t-shirt) are not terribly rare, and Jocasta Nu is one example. In addition, all examples of Jedi Younglings I see have crewnecks only, no variation apparent. Source: First Class Eeth Koth is one of a few who wears more of a turtleneck design. This design is most often seen on alien Jedi and is most likely made from some kind of knit fabric such as jersey, to achieve that scrunched effect. 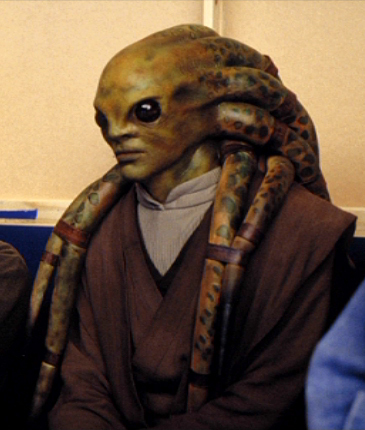 Source: First Class Here, Kit Fisto has a Mandarin Collar on his undertunic. This collar type is rarely seen, the only other example I have noticed has been on Yoda and Yaddle's outer tunics. Kit also appears to still have a second, dark brown undertunic, unless the collar is attached to a darker shirt. Source: First Class Ki-Adi-Mundi's collar type is very rare. His collar is high and shaped, interfaced and possibly even boned to hold the structure. This is the only example of a rigid collar I've seen. Source: First Class Most Jedi that have no visible undertunic usually have radically different outer tunics, and mostly because they are an alien species with a different physiology than humans. Adi Gallia is an exception, but one of the rare few. I see no other humans who don't have an undertunic.